What are veins and why are they important? There are two main types of blood vessels in the body and these are arteries and veins. Your arteries have thick walls and move blood away from your heart, while your veins have thinner walls and return the same blood to your heart, minus much of the oxygen and nutrients. To do their job, arteries are tough enough to cope with the pressure-generated by the heart to push the blood along, but veins can only withstand low pressure and, where possible, rely on gravity to return blood to the heart. In the legs, your veins need to work against gravity and so pressure can build up in those closest to the skin’s surface. 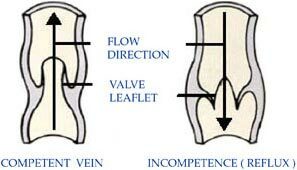 This can cause the valves within the veins, which are there to help prevent the blood flowing backwards, to fail. This, in turn, leads to venous reflux, venous disease and varicose veins. Why do only some people get varicose veins?